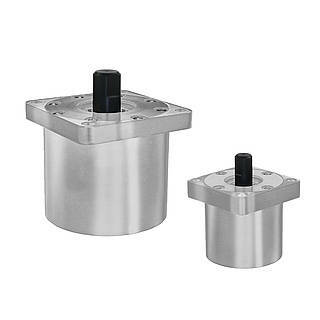 Hydraulic rotary damper range providing smooth and controlled rotational motion up to 700Nm torque. Maintenance free self contained rotary dampers for photocopiers lids and covers, printers or cupboards. For vibration-free opening and closing rotary dampers provide comfortable and safe component handling. Product uses can be found in both private and industrial applications. Rotary dampers can be used for damped hinge compartments, covers and handles such as those found in automotive cars. In household technology or entertainment electronics, rotary switches or covers, rotary damper shock absorbers penable the precise, low-noise and gentle operation of CD players in Hi-Fi systems for example. Rotary hinge dampers offer a solution for controlled closure of covers and lids with clockwise and anti clockwise control. Stainless steel or aluminium body high torque rotary dampers up to 700Nm, adjustable rotary dampers, 110°, 180° clockwise/anticlockwise or 360° continuous rotary damper deceleration characteristics available. Small miniature compact plastic or aluminium body rotary dampers with torques up to 9Nm.